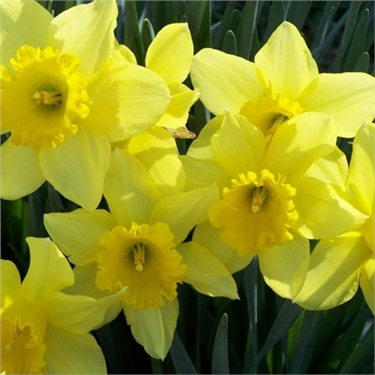 Daffodils are showy flowering bulbs that are known botanically by the name Narcissus. The extremely low-maintenance plants emerge during the spring months and are in landscapes and gardens all over the country. Daffodils are members of the Amaryllidaceae family. Other common names for the daffodil are "paper white" and "jonquil." Daffodils are definitely poisonous to cats, however, the plants are toxic to not only felines but also other animals including horses and dogs. The whole plant is toxic, especially the bulb. If your kitty consumes any part of the plant -- particularly the bulb -- they may experience dangerous toxicity, so beware. These flowers contain lycorine, an alkaloid with strong emetic properties (something that triggers vomiting). Crystals are found in the outer layer of the bulbs, similar to hyacinths, which cause severe tissue irritation and secondary drooling. Ingestion of the bulb, plant or flower can cause shivering, decreased blood pressure, seizures, diarrhea, excessive drooling, throwing up, nausea, tissue irritation, rapid heart rate, stomach pain, laboured breathing and heart arrhythmia. If you have any reason to think your little one ate any part of a daffodil, seek emergency veterinary assistance for them before you even get the chance to spot any of these signs -- the faster the better.